Promotional value expires 120 days after purchase. Amount paid never expires. Limit 5 per person, may buy 5 additional as gift(s). May be repurchased every 90 days. Limit 1 per visit. Valid only for option purchased. Merchant is solely responsible to purchasers for the care and quality of the advertised goods and services. 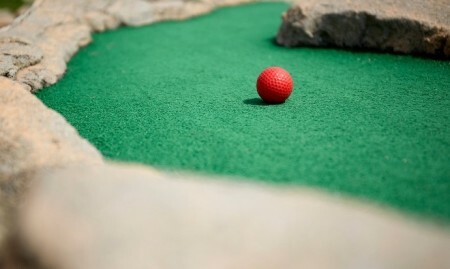 With its sand traps, rocks, streams and ponds, the miniature golf course at Target Golf Centre provides many of the same challenges as a full-size course. At certain spots, players also have the chance to bank shots off cleverly placed curbs. Some of the strategies used on the mini course carry over to the centre’s target greens, where golfers can aim their balls at actual targets instead of smudges on the side of their neighbor’s house. The centre’s visitors can also trade their golf club for a bat and step into one of two batting cages, where machines hurl baseballs and softballs at speeds of up to 90 miles per hour.